When it comes to seeking out good food, there is no road too long for me to travel (unless I'm hangry). My boyfriend and I spend much of our free time together embarking on food pilgrimages, travelling as far and wide as humanly possible in search of new and exciting culinary experiences. So when we were offered the opportunity to dine atThe Great Northern Restaurant & Pubin St Albans, we jumped straight on the train out of St Pancras and prepared ourselves for a feast of Great British fare with a twist. Just 20 minutes later, we arrived at The Great Northern Restaurant and were immediately welcomed into the intimate yet lively space. At the bar, we were handed the drinks menu and after a quick glance, we realised that this is not your average working man's 'pub'.The Great Northernserves a vast selection of pale ales, lagers, ciders, spirits and whiskies but has an even greater selection of wines, dessert wines and champagne, offering tipples for the most sophisticated of drunks. To officially start the evening, we cheers-ed with a glass of New Zealand Sauvignon Blanc and a San Miguel and were shown to our table in 'the snug'. The Great Northern has three definitive areas for dining: the snug, which seats approximately 20 covers, the bar area for those wanting a more relaxed service and in warmer weather, the spacious garden. Our table was located at the back of the snug, offering us a panoramic view of the dining room and optimum viewing for people-watching (my favourite). After settling into our home for the next few hours, we began to prepare ourselves for making the most important decision of the day:what are we going to eat? The Great Northern's food menu is small but perfectly formed, priding itself on serving a locally-sourced, seasonal Modern British cuisine. One thing to note is that the kitchen is keen to cater for those with special dietary requirements, making it a great dining choice if your loved ones struggle to find places who cater for a more precise palate. For starters, I ordered poached trout with soy and chilli while Tom chose the braised brisket with pearl barley and beef consommé. In my wealth of dining experience, the starters usually set the bar for the rest of the meal and both were plated up beautifully on big, circular, Scandinavian-inspired crockery. The trout was delicate and flaky fused with fresh flavours from the tomatoes and a perfect amount of chilli, while Tom practically inhaled his brisket (I take that as a sign that it was as delicious as mine). Like the starters, the presentation was faultless and I have no problems with my fish being served on the bone. This may sound slightly odd but to me, there's something rather satisfying about sliding the fish delicately off the bone before you taste its wonderful flavour. 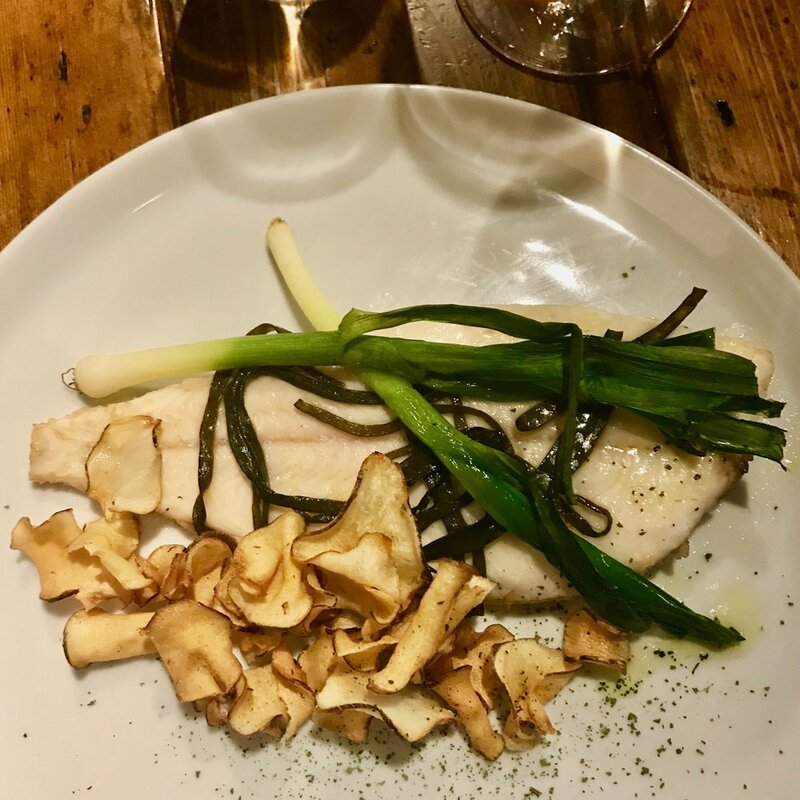 And the lemon sole was as delicious as it looks in the picture: simple, locally-sourced ingredients created a main course that was balanced, wholesome and full of the subtle flavours that you want from a fish dish. However, the crunchy artichoke crisps are not something you typically see at your local pub restaurant but they added a touch of elegance to the dish and the texture worked perfectly with the flaky fish. Last but not least, dessert. I can never resist a chocolate brownie after a good meal and The Great Northern's take on my old favourite was a smooth chocolate ganache-style brownie topped with cashew nuts. It was my idea of heaven: decadent, chocolatey and nutty. My only qualm has to be that it wasn't quite big enough (but I'm greedy and there can never be too much of a good thing when it comes to chocolate brownie). Not wanting the feast to end, we ordered glasses of the Moscato d'Asti DOCG dessert wine and reflected on our first impressions of dining in St Albans. It seems that great foodandeven better wine can be found outside of London and the passion shown by The Great Northern for good, quality, well-priced food is unmistakable. They truly take pride in their food, serving a familiar Modern British menu with a sprinkling of creativity. We loved every element of our visit: the homely setting, the welcoming staff and each delicious forkful of food that passed our lips.So much so, we missed our train back to Essex.